Documentation on the actual contents and makeup of the BoKS database is sparse and hard to find. The BoKS system administrator's manual doesn't mention any details, nor does FoxT's website. This isn't very odd, because in general FoxT would not recommend that people muck about in the database. However in some cases it's very important to know what's what and how you can extract information. Case in point, my earlier database dump script for migrations. In the past I've pieced together an overview of the various database tables, which is far from conclusive. I still need to update this list using some unofficial BoKS documentation, but below you'll find the summary as it stands now. 6 Hosts 33 ? don't know yet ? 11 ? don't know yet ? 38 ? don't know yet ? 41 Server virtual cards ? 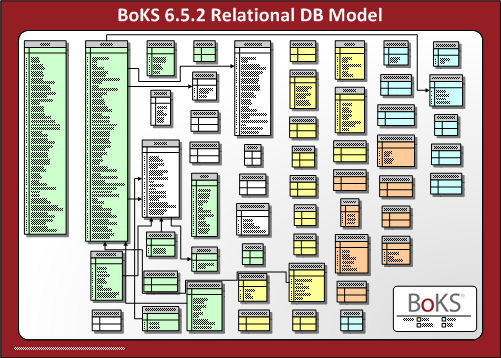 My colleagues Erik Bleeker and Patryck Winkelmolen have created a lovely Visio diagram of the BoKS database, its tables and fields and the relations between all of these. It took them quite a while to complete the puzzle, so they should be proud of their work! Lucky for us they were friendly enough to share the drawing with the rest of the world. 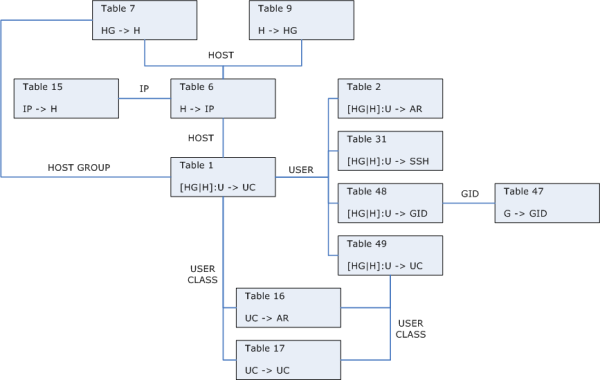 I've included the Visio schematic over here with their permission.